Welcome to our shop, you can buy any of the full range of games through PayPal here. If you require larger quantities, contact us for a quote on bulk purchase discount rates & postage costs. Please note: Postage costs on Paypal are for UK only (multiple purchases will accrue a collective, reduced postage cost). Contact us before ordering if outside the UK and we’ll calculate your P&P. 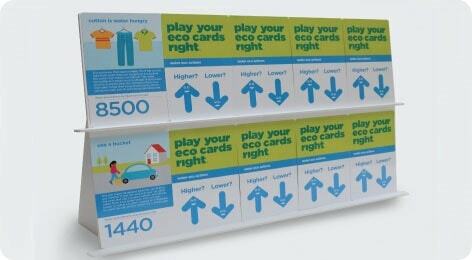 Packaging: In our continuing efforts to minimise packaging that’s used & discarded, esp. bubble wrap, we always try to re-use the packaging that our games are delivered to us in. So please be understanding if your games parcel looks less than pristine, it’s because it’s on its second life, and does the job just as well as virgin packaging but without the environmental impact! 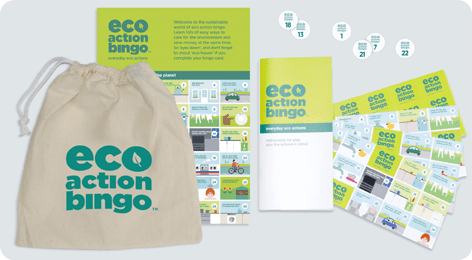 Purchase eco action bingo (in a bag). 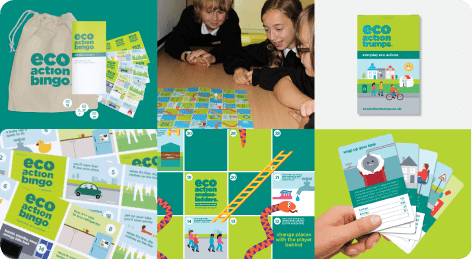 Available in 7 themes: everyday, office, energy saving, energy saving in schools, water saving, food waste and waste & recycling themes. Table top sized version of our popular game. Made from recycled/FSC board, and comes complete with pop out counters and a spinner. Available in 9 themes – everyday (home), water saving, office, waste & recycling, energy saving, energy saving in schools (giant size only), air quality, plastic pollution and food waste reduction actions. 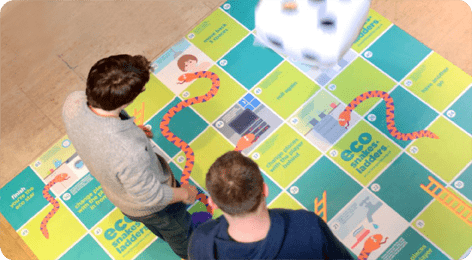 For personalisation and branding options on the giant snakes + ladders board (2.5 m2), contact us here We can create your own version with actions most relevant to your business or campaign, or you can take one of our existing 9 themes (listed above) and add your logo to the board. Prices start at £350 (ex VAT & P&P of £15). Comes with an inflatable dice. Higher? Lower? 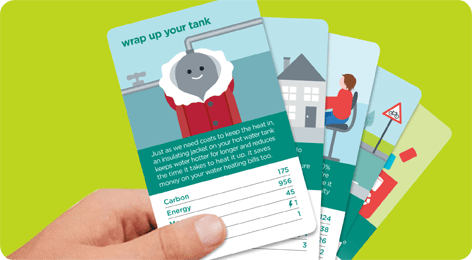 Test your knowledge of the carbon, energy or water saving potential of a range of eco actions – 30 A4 size, durable, laminated cards, an ‘instructions for play’ card and a Questions card. Available in 6 themes. Special offer: The games station, a shelving unit especially designed to facilitate this game (as featured in photo). Purchase the unit separately for £45 (ex VAT & delivery), or buy the whole kit containing the game, shelving unit PLUS a large, unbleached organic cotton satchel bag to keep it all in, for a special price of £120 (ex VAT & delivery). Contact us to purchase. 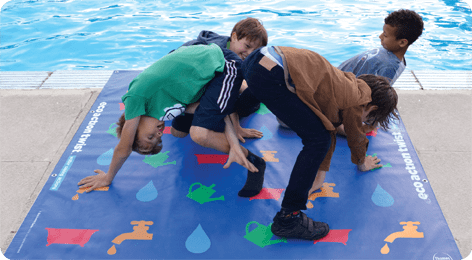 To purchase the playground contact us here for payment options (we can send a proforma invoice). All contained in an organic cotton, ethically produced drawstring bag that doubles up as the bingo ball holder. 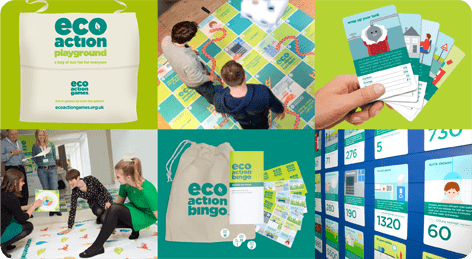 Choose from 6 themes (please note: with the Energy theme you will receive the Everyday bingo game).